Beverly in Movieland: Rock Needs River: Are People Who Need People the Luckiest People? Rock Needs River: Are People Who Need People the Luckiest People? Once when I was on an airplane with my small blonde daughter, a nosy fellow passenger studied the romping toddler (airplanes weren’t so crowded back then), and asked, “Well, is she home-grown or is she off the shelf?” So stunned was I by the implication that my child wasn’t biologically my own that I had no snappy comeback. But I realized in an instant that adoptive mothers and fathers must face this a lot: the need to confirm that they are the “real” parents of their own children. Naturally, the movie industry loves a good, schmaltzy adoption story. What could be more engrossing than a tale that highlights a character’s search for identity along with the desperate quest for someone to love? Adoption stories offer so many angles: those of the would-be parents, the birth mom and dad, the child who needs a welcoming home. Depending on the perspective, an adoption story can be heartwarming or perhaps tragic. Or maybe a bit of both. Among recent films that deal with adoption, I can immediately think of three. Juno, from 2007, sees adoption through the eyes of a very young birth mother. 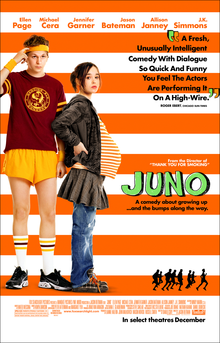 As indelibly played by Ellen Page, Juno is a sixteen-year-old schoolgirl who accidentally gets pregnant by an equally naive classmate. Still a child in some ways but surprisingly mature in others, Juno decides that abortion is not for her, then sets about finding the ideal adoptive parents for her baby-to-be. The couple she chooses turn out to have problems of their own, but there’s a happy ending for the right prospective mother. And Juno, her problem solved, is glad to go back to being a kid. There’s a more ambiguous ending to two 2018 films. A documentary, Three Identical Strangers, concentrates on three young men who discover themselves to be identical triplets, separated at birth. It’s the sometimes painful story of what it feels like to discover parts of your history that have long been a dark secret. Then there’s Private Life, in which writer/director Tamara Jenkins captures her own struggle as part of a couple desperate to have a baby. In the film, Kathryn Hahn and Paul Giamatti are rapidly ageing creative types who have tried every sort of fertility treatment in hopes of producing their own little bundle of joy. They explore adoption too, but have already faced a cruel blow: a young birth mother who strung them along, then inexplicably disappeared from their lives. Eventually they decide to get their hopes up yet again. 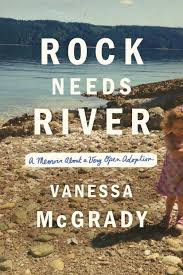 Adoption is on my mind because I’ve just finished reading Rock Needs River: A Memoir of a Very Open Adoption, by my colleague, Vanessa McGrady. Vanessa is the adoptive mother of a delightful little girl named Grace, and her real-life story has more than the usual twists and turns. After many attempts amid some complicated domestic challenges, Vanessa discovered she was not able to carry a pregnancy to term. Having deeply researched open adoption, she bonded with a pair of young musicians unwilling to share their peripatetic lifestyle with their child-to-be. The legalities of the adoption went smoothly, but there came a time when—discovering that Grace’s birth parents had become homeless—Vanessa took them in. Her book, in which she continues to ponder this fraught relationship, reveals how hard it is to be good-hearted, when your sense of obligation tugs at you from all sides. Thankfully, she and Grace continue to thrive, buoyed by her book’s success as well as the tight parent-child bond in which they both seem to revel. Which is, of course, the best kind of happy ending.